Sunday brought sunny skies and a capacity crowd to Mo-Kan Dragway as the first round of eliminations kicked off with a powerhouse match-up between Bobby Marriott and Donny McSwain. The quickest four winners from this round would advance to the semi-finals. McSwain had the performance advantage heading into the bout, but fell off in his first round pass as his 4.23 at 163 mph wasn't enough to hold off Bobby Marriott's 4.14 at 181 mph as "Shockwave" moved on. Raymond Dawson's "High Octane" blown alcohol entry was out next alongside the new look "Metal Mafia" nitro burner owned and driven by Sean Belt. Belt was making his first OFAA appearance of the season in his beautiful machine. Dawson showed no mercy, clicking off a strong 4.04 at 176 mph while Belt fell off to a 5.37 at 111 mph. Aaron Leyda brought the Dale "Lurch" Wilkens owned and tuned "Hemi Hunter" to life ready to take on Mark Bowman's "Blown Income" machine as the first round of eliminations continued. 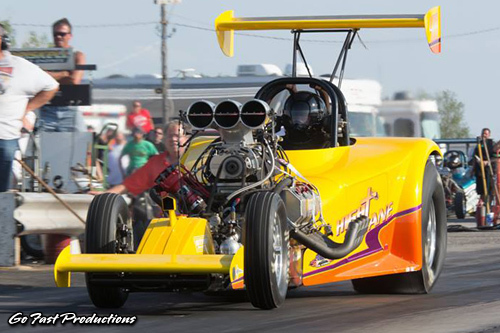 Leyda took the starting line advantage and never trailed with a winning 4.26 at 166 mph to Bowman's close 4.33 at 169 mph. Number one qualifier John Broussard and points leader Jimmy Jones were up next. This pairing had huge points implications as Broussard trailed Jones by just seven points after qualifying at Mo-Kan. The winner here would have the chance to take major strides towards the 2014 Painless Performance Products Championship title. The cars crept to the line after side by side burnouts and crew chiefs made their final adjustments before sending their drivers to the beams. Broussard was on his game and took the advantage at the hit. Jones was charging hard as the cars were side by side at half-track, but at the stripe, Broussard's 4.02 at 177 mph held off Jones' very close 4.04 at 178 mph to knock out the points leader in round one. Closing the round, Doyle Smith's "Chemical Reaction" was set to take on Donnie Massey's "Showtime" but Massey ran into mechanical issues on the warm-up for first round and couldn't make the call, as Smith soloed to a 4.31 at 128 mph win. Smith's streak of luck continued as he was inserted into the semi-finals replacing Raymond Dawson who broke on his first round winning race. Smith would take on Aaron Leyda in the semi-finals and Bobby Marriott paired up with John Broussard. As the sun set over Mo-Kan Dragway, the OFAA semi-finalist retuned to the staging lanes to suit up. First out was Aaron Leyda who has been an OFAA regular for many years, yet was making just his first series appearance this season. Leyda clicked off his best pass of the event with a clean 4.16 at 169 mph to take out Doyle Smith who dropped off to a 5.17. In the final pair of the round, John Broussard lined up with Bobby Marriott. Broussard had been living in the 4.0 range and had the advantage on paper, looking to take the points lead away from Jimmy Jones with a win over Marriott. Broussard and company did just that as the "Purple Haze" entry blasted to a 4.04 at 176 mph to defeat Marriott's 4.12 at 176 mph. The new points leader Broussard now had a chance to extend his lead over Jimmy Jones by clinching his third career OFAA event win. Aaron Leyda had other plans as he hoped to notch his first career OFAA event win as the teams pulled into the staging lanes ready for the final pairing of the night. The cars came to life and after their burnouts it was time to bring them to the line. 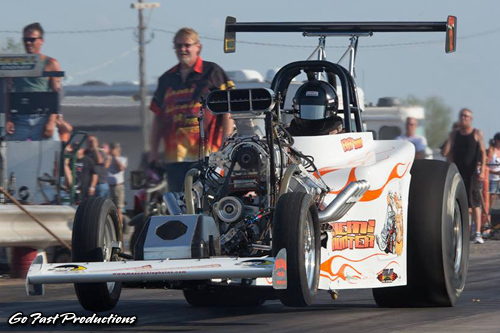 Two hard charging, very consistent, alcohol burning machines were ready for battle but this one was over early as Broussard jumped the tree with a -.054 reaction time, wasting a stout 4.02 at 175 while Leyda cruised to a solid 4.23 at 169 mph and his first career OFAA event victory. For the "Hemi Hunter" team and owner / crew chief Dale "Lurch" Wilkens it was a memorable win. Broussard and company had nothing to hang their heads about as they qualified number one and assumed the points lead with a strong runner-up finish. "I couldn't be happier for Aaron and his father Larry. I've done my share of winning in the early days of the series when we were giving our show away for free just to have a place to race back in the late 90's. The track was very tricky but we made it down pretty nice and qualified in the top half of the field which helped our position on the ladder. Broussard had the best car all weekend no doubt and it was a shame he went red, but he knew Aaron is killer on the tree and that I would get the car down the track. I tried to run a mid 4.0 but it spun. When we got to the top end Aaron thought he was the one who red lit, he was so busy behind the wheel he missed the win light. It's been a great season for the "Hemi Hunter" camp this year, we're having a lot of fun," said Dale Wilkens. 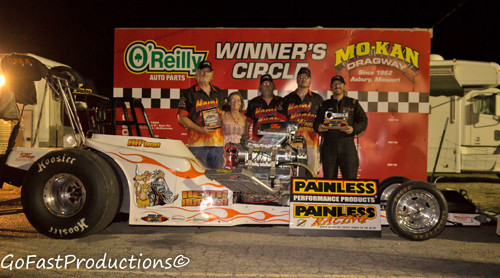 Leyda left with the hardware and the bragging rights but Broussard made the most noise by taking over the Painless Performance Products points lead with just two events remaining in the 2014 season. 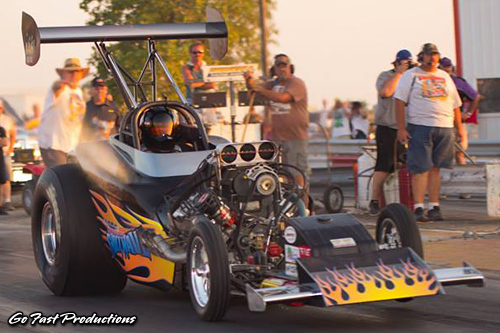 With a 15 point lead, Broussard and company will head to North Star Dragway in Denton, Texas on Saturday, October 4th for the seventh of eight races on the schedule. 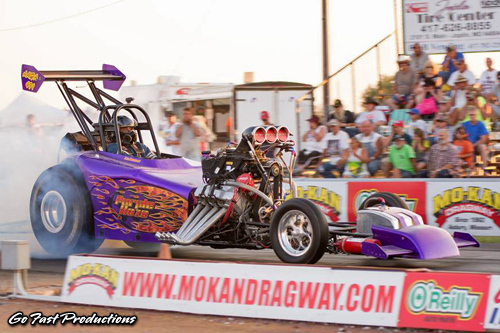 The OFAA would like to thank Carl Blanton and the staff at Mo-Kan Dragway for another awesome Labor Day Classic. Also thanks to OFAA sponsors including Painless Performance Products, Good Vibrations Motorsports, North Texas Diesel, Competition Sales of Dallas, Napa Auto Parts and Wizard's Warehouse.